A large forest or landscape tree, reaching heights of 90 feet or more and a trunk to 4 feet in diameter, with a dense, pyramidal or oval crown, the spreading branches often reaching the ground in open settings. Occurs on rich, moist, well-drained soils on streambanks or the borders of river swamps in southeast Texas. It has been widely cultivated as an ornamental tree outside its native range. Simple, alternate, 6" to 8" long and 2" to 3" wide, elliptical or oval in shape, thick, leathery, dark green and glossy above, rusty and pubescent beneath, with prominent midribs. They remain on the tree for about two years. Large, showy and fragrant, 6" to 8" across, cup shaped, with pure white petals surrounding a splash of bright purple in the center, borne in spring and summer. A rounded or oval aggregation of seeds, shaped like a cone, 3" to 4" long, containing many seeds. The fruits open in the fall and display the bright red seeds dangling on slender threads. Gray-brown, smooth at first and developing scales on larger branches and trunks. Moderately heavy, hard, and cream-colored; was used chiefly for furniture, Venetian blinds, and fuelwood, but is now highly valued as a landscape specimen. Sweetbay magnolia (Magnolia virginiana) has smaller, semi-evergreen leaves and flowers. 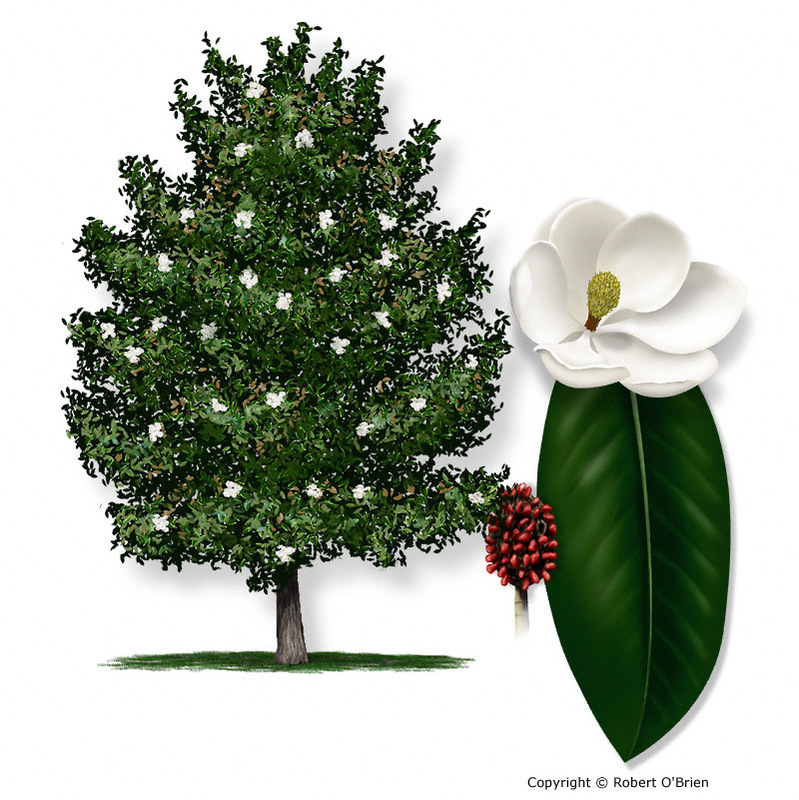 Magnolias are an ancient genus, one of the oldest flowering plants, extending back approximately 130 million years.